Rohit Dugar is sitting in a rustic tasting room, overlooking the Southside’s view of the sea, admiring a glass he’s just filled with a vibrantly amber ale. “This one’s made with buckwheat. It’s a light, delicate refreshing beer,” he says, the sun gleaming through the liquid as he tilts it slightly. Dugar is proffering a taste of the Cha Cha Soba ale, one of the unique offerings from Young Master Ales – an exciting new Ap Lei Chau microbrew, which launched late last year. The brewery itself is a rare sight in Hong Kong, comprised simply of a large brewing space bursting with tanks and tubes for making, a storage room filled with crates of bottled brews adorned with Young Master Ales’ signature red-pants logo, and this tasting room, which is dripping in a minimalist artisanal aesthetic. One of Hong Kong’s first ever microbreweries, Dugar launched Young Master Ales with a view to create beers drawing on Hong Kong’s heritage; unique to our city and not another arbitrary, culturally agnostic product. Thus, Young Master Ales’ Hong Kong Black, a hoppy porter, uses Chinese red sugar, and he plans for their future summer brew to feature ‘teas, spices and Chinese traditional medicine, which actually has great flavour’. While the flavours Dugar and his team are bringing to Hong Kong are quite unique, the emergence of Young Master Ales is indicative of something much larger happening in Hong Kong at the moment – the rise of a culture of brewing. Beer, it’s the great social unifier. Unfortunately its presence in Hong Kong has long been restricted to the hyper-commercial brands we’re all familiar with – the brands that populate every corner bar, supermarket and convenience store in the city. Only Hong Kong Beer, established in 1997, has sought to bring a locally produced microbrew to our palates on any scale, with few other ventures joining it. But in the last few years, that has started to change. Indeed, in addition to Young Master Ales, there are a raft of projects contributing to a newly enlivened beer scene. Ranging from commercial microbrews and newly launched brewpubs, to importers, distributors and homebrewing specialists, it’s now a beer market that Dugar describes as ‘extremely receptive and ready for [microbrews] finally’. The thirst for craft beer in Hong Kong has increased exponentially over the years to its current position – particularly since a pivotal change took place in 2009, with the elimination of taxes on low alcohol beverages (a measure that has been talked about much more in the context of wine). This created an opening for the import of craft beer, which just wasn’t possible with the bloated cost of duty. “This put Hong Kong in a unique position. At the time there was very little local beer, so what it enabled was good beers to be brought in,” says Toby Cooper, owner of the The Globe, chairman of the Craft Beer Association of Hong Kong and all-round beer fanatic. It was also in 2009 that the city saw one of its first microbreweries appear, when Pierre Cadoret opened the low-key Typhoon Brewery in Mui Wo in 2009, coming into a craft beer landscape that the Englishman describes as ‘barren’ with the dream of producing real ale for our city. Cadoret’s first brew was the T8, a modern bitter, and he later released a golden ale, the Eastern Lightning brew, which went on to win the International category (ironically) at the 2011 Hong Kong International Beer Awards. Unfortunately Cadoret hasn’t brewed for around 18 months, with his Mui Wo space subject to significant rent increase. But Cadoret is on the lookout for a new space – he may have found it in Chai Wan! – where he may be brewing again shortly. While Typhoon was one of the first Hong Kong’s microbreweries, Tipping Point Brewing Co is the most recent to step into the scene. Taking up premises on Central’s always bustling Wyndham Street, Tipping Point – founded by Que Vinh Dang, the former chef of TBLS – is the city’s first brewpub, with the promise of bringing ‘a chef’s approach to brewing’. With craft beer being a large fixture on the TBLS drinks menu, Dang’s new bar looks to take things to the next level, embracing the coming of age of the scene, with the name of his new venture acting as a kind of cultural commentary in its own right. In addition to more than a half dozen draft crafts on tap, Tipping Point is also set to offer a rotating lineup of Dang’s own creations on the premises, bringing innovative, experimental creations direct from the brewing tanks to thirsty drinkers. On top of Young Master Ales, Typhoon and Tipping Point, there are a number of other microbrews coming to a tap near you. 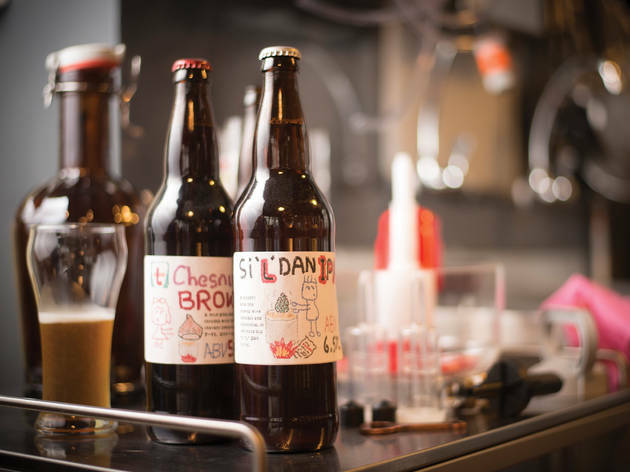 Indeed, Hong Kong Beer, the city’s first microbrew established in 1997, has just launched a new brewery in Chai Wan, complete with ‘state of the art’ equipment, a new brewmaster and a fresh range of beers, and will use March’s craft beer festival, Beertopia, as a relaunching pad. New Empire, a somewhat mysterious microbrewery, will also be releasing their debut brews at Beertopia. Since launching, HK Brewcraft has grown from a small startup to becoming one of the central figures in the brewing scene in the last year and a half. And Wong sees this growth continuing on an exponential level. “At the beginning, we had very few customers, apart from ourselves. Then I met some guys and now we have the Hong Kong Brewers association and that’s growing. A lot of guys didn’t homebrew in Hong Kong because they thought it was illegal and they couldn’t get the ingredients,” he says. Indeed, homebrewing once was illegal in Hong Kong, but since 2000, producing up to 50L of beer for personal consumption has been allowed. This sentiment encapsulates what is, perhaps, the most exciting element of the emergence of Hong Kong’s brewing scene: that we’re finally seeing beer that’s unique to Hong Kong and reflects our city’s singular characteristics. From commercial ventures like Dugar’s Young Master Ales to homebrewers like Goldberg, as well as an ever-expanding pool of receptive and curious consumers, we can only describe the future as bright and hoppy with a delicate, delightful finish. 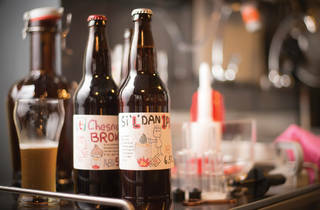 4/F, 15 Cochrane St, Central, 5925 2739; hkbrewcraft.com.